" Nominated for 2012 'Best Emerging Artist' by Offbeat Magazine - New Orleans, LA "
Fifteen-year-old award-winning guitarist/vocalist Matthew Davidson from Shreveport, LA began performing professionally in 2010 and since then “has achieved an immense amount of recognition, support and admiration”, according to International Musician magazine. With musical influences as diverse as The Beatles, Stevie Ray Vaughan, Maroon 5 and John Mayer, Davidson is a triple-threat: guitarist, vocalist and songwriter…performing rock, blues and pop with equal command. Matthew released his debut EP “Step Up” in 2012, produced by legendary bassist Joe Osborn. “Matthew has been making some major waves in the music world, and stunning the ears of multiple guitar enthusiasts and organizations across the country”, reports Guitar International. To date, Matthew has over 225 performances to his credit. Acclaimed photographer Robert Knight recently invited Matthew to join “The Brotherhood of the Guitar” (BOTG). The BOTG is a project launched by Knight and sponsored by Fender Guitar, Guitar Center, and Ernie Ball. The BOTG’s purpose is to shine a spotlight on a select group of unsigned up-and-coming young guitar players from around the world. Knight recently filmed an interview with Matthew and photographed him at the Guitar Center in Shreveport. 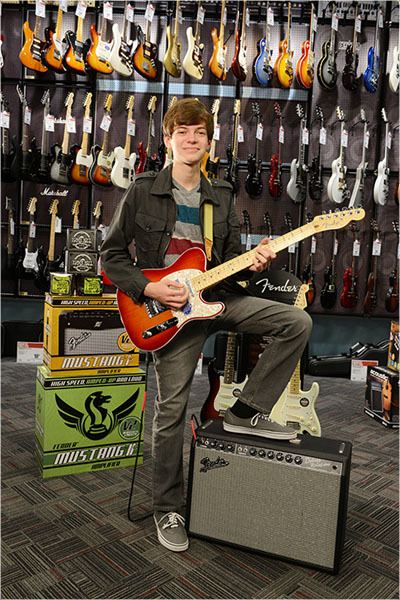 Matthew will be featured in an upcoming issue of Guitar Center’s monthly national catalog “At: Guitar Center”. Matthew was the 2011 winner of the Robert Johnson Blues Foundation New Generation Award. “His style was advanced for his age,” said Steven Johnson, Robert’s grandson and vice president of the Robert Johnson Blues Foundation. “It was crisp; it was professional. His style with that electric guitar was amazing. I know Matthew will be a great ambassador for the Foundation”. 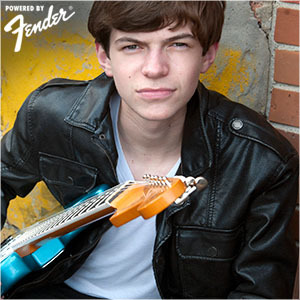 Matthew was selected as the guitarist for the 2011 “Kidd Kraddick in the Morning” Rock Camp Band. Four young musicians were selected from a group of over 300 applicants. During the camp, the band performed both live on the air on “Kidd Kraddick in the Morning” (a nationally syndicated radio show) and at the Dallas House of Blues with Patrick Stump from Fall Out Boy. Davidson got his first taste of guitar at the age of three, when he received a toy guitar for Christmas. He started taking lessons on an acoustic guitar in the second grade and won his first electric guitar in the 2007 James Burton Foundation’s Guitar Showdown. He was the youngest of eight student guitarists selected to play with Kenny Wayne Shepherd at his 2009 Artbreak Concert. Matthew performed in the Youth Showcase at the 2011 International Blues Challenge in Memphis, TN and while there jammed at the B. B. King Blues Club. He also was selected to perform in the “Texas 10 under 20 Showcase” at the Dallas International Guitar Festival. In Mississippi, Matthew has played at the B.B. King Museum and the B.B. King Homecoming Concert in Indianola, the Delta Blues Fest in Greenville, and the Ground Zero Blues Club and Pinetop Perkins Homecoming Celebration in Clarksdale. Matthew has performed at Rock ‘N’ Bowl, The Ellis Marsalis Center for Music and The Old U.S. Mint in New Orleans, Bibb Graves Hall in Alabama, The Strand Theatre, and on the stage of the legendary Municipal Auditorium, home of the famed Louisiana Hayride. Matthew is the youngest member to date of the American Federation of Musicians Local 116, having joined at the age of twelve. His most recent honor was being invited to join Kenny Wayne Shepherd on stage at the 59Twenty Music Festival in Meridian, MS.
Louisiana, Dallas House of Blues, Ft. Worth Mayfest, the KTBS 3 Independence Day Festival, Holiday in Dixie, The T-Bone Walker Blues Festival, The East Texas State Fair, The Krewe of Centaur Mardi Gras Parade, Natchitoches Christmas Festival, Independence Stadium, and many more. Be sure to check the Reviews page to read what people are saying about The Matthew Davidson Band!